Long before various members of the British monarchy began building grand estates across Wales, it was inhabited by Celts, whose ruins populate the country, including Castell Dinas Bran. It’s the perfect hilltop ramble for anyone who wants to see the sights without breaking much of a sweat. You’ll weave past sheep-packed hills and Llangollen’s legendary canal – to this day, horses still pull barges up and down the waterway – to a former Iron Age fort later embellished with a 12th-century castle. The reward at the pinnacle: Miles of classic Welsh views. The ocean-scapes in this part of the U.K. aren’t too shabby, either. Anglesey, where the newlyweds live, is situated on the Isle of Anglesey. The more than 200-square-mile island is the largest in the Irish Sea, and it was once referred to as the “Mother of Wales” during the Middle Ages, thanks to its fertile fields. There’s a bit of magic to this not-so-small parcel of land, where the Welsh version of St. Valentine spent her days. When you’re not trying to “bump” into the celebrated couple – word has it that when Prince William isn’t busy plucking people from the sea, he likes to grab a bite at The White Eagle in Rhoscolyn – you can walk the perimeter of the isle along the 125-mile Anglesey Coastal Path. Highlights include the rugged sea arches at Bwa Gwyn and the popular proposal spot, Llanddwyn Island. According to legend, St. Dwynwen, the patron saint of lovers, sequestered herself on this narrow spit of soil, where she welcomed couples hoping to divine their futures together. 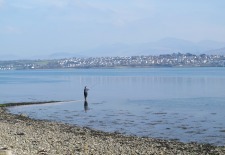 For outdoorsy types, the Anglesey Riding Centre offers horseback excursions along routes that hug the coast, with views of the Menai Straits and Caernarfon Castle, an Edward I creation. It served as the setting for the Investiture of Prince Charles as the Prince of Wales in 1969. In Trearddur Bay, outfitter Surf Lines leads kayak trips through a cerulean blue bay encircled by beautiful homes that look as if they were lifted from a scene in The Great Gatsby. Of course, no venture to Wales would be complete without a stop in the walled town of Conwy, which once supplied countless London jewelers with pearls from its celebrated mussels in the early 19th century. It’s worth a visit here just to sample the meaty, salmon pink bivalves at Amelies, prepared with the classics – garlic, shallots, parsley, wine, and cream. 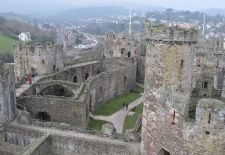 Conwy has one other must-see: the epic, 13th-century Conwy Castle. This is Wales, after all. See our Wales Travel Guide for more trip-planning information, then use our Travel Search price comparison tool to find the lowest rates on flights, hotels, packages, and more travel deals.